No Janders this week as he’s on his holidays down in Cornwall, I pulled into the fishery car park and judging by the number of vehicles I knew we wouldn’t just be on Sellicks today. One of the first people I bumped into was Glynn Wickham who said instead of Lily, the overflow would be on Willow today and everybody was expecting the top silvers weight to come from there. Pete was also on holiday and had left Adie in charge who was doing a sterling job but it left a vacancy for a tea boy, a role which fellow blogger, Dom Sullivan, filled admirably! Peg 2 on Sellicks was the golden peg and when Steve Kedge drew it, there was a good chance he could be in for a bumper payday. Glynn was on peg 13 and not happy until Adie told him he was actually on Willow, a great silvers peg and I declined his invitation to have a side bet! I pulled out peg 20 on Sellicks again and in the last four matches I’ve either been on 20 or 21, I’m not complaining though as it’s a very consistent area for silvers, I just wasn’t sure it would compete with the pegs on Willow. For company this week I had Jacko on 18 and Mark Leahy on 21 as my usual neighbour, Jess Jordan, was on the opposite side of the lake and people were asking if we’d fallen out! I won’t go into too much detail with the rigs as I’m sure you all know by now that a 0.4 gram Malman Pencil would be first out of the box followed by a Drennan 0.6 gram Drennan G-Tip! On the whistle I cupped in half a pot of micros on two ten metre lines, angled to the left and right and the same at five metres before shipping out with a 4mm expander on the hook (Bait-Tech Xpands of course!). The rig settled and after a couple of minutes disappeared from view, for once I didn’t miss the first bite although it was obviously a decent carp which wasn’t my target species and after a lengthy tussle I slipped the net under a lump of 5-6lb. A nice fish but not what I was after! The next bite I had came from a skimmer of 4oz or so but it came off as I gently fed the pole back, then I had a decent skimmer before I suffered a run of missed bites and that was basically it for the first hour although nobody looked to be bagging. Early in the second hour I had another nice skimmer and a bit later hooked a fish which didn’t feel like a carp but any thoughts of it being a crucian disappeared when it powered off and then a lovely tench around a pound and a half popped up which took me by surprise somewhat! So after two hours I probably had 2.5lb and was doing okay, Mark and Jacko were getting odd carp and snake charmer Roger Russell up on peg 17 had landed a couple of nice eels. I was hoping to build on my steady start during the third hour but I was still missing bites and all I could catch was carp, I tried the right hand line for the first time but all that yielded was yet another carp. Mark kept hooking a root on the far bank and he was mystified as he’d been fishing the same spot for two hours without snagging it once! I suggested he could change his surname from Leahy to ‘Levi’ and perhaps put some ‘Reggae Reggae sauce’ on his pellets! Roger had a decent crucian and there now wasn’t much between us but apart from the odd carp I just couldn’t catch from my longer lines. 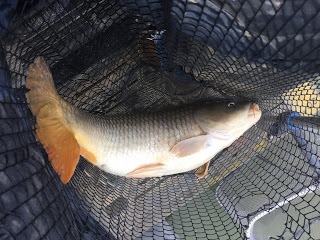 I was thinking about trying the five metre line which I’d been feeding for 3.5 hours when I hooked another carp and was joking to Mark that it was a big crucian but then that’s exactly what it turned out to be and at 1.5lb it was another nice bonus. Next chuck I’ve had a good skimmer which by my reckoning put me back in front of Roger, he shouted up to ask how I was doing, I said I was struggling before asking him how he was getting on, along with the eels and the crucian, he’d also sneaked in a tench which I didn’t know about so it was still too close to call. I had a couple of small blades from the longer line but another carp made my mind up, it was time to try my five metre line with around two hours to go. In the last match I had two good skimmers and a crucian so I was hoping for more of the same today but it just didn’t happen, I lost a big carp but the only two silvers I managed were a small roach and a blade and then I looked up to see Roger landing what looked like another tench and I needed another decent fish. Just before the all out I hooked a fish but there was no fairy tale ending as it was another poxy carp. I ended up with around a dozen silvers which I thought would go between 4-5lb plus about 7 or 8 carp. As I was packing up, Roger walked past and I said I thought he’d done well but he said his eels were only little bootlaces! The scales started over on Willow where Paul Homewood set the bar very high with 130lb 11oz of mainly carp from peg 9, Glenn Bailey was the next best weight with 66lb 9oz from peg 1 and as expected Glynn had done well catching 10lb 6oz of silvers from peg 13 and I didn’t think anybody would come close to that on Sellicks. 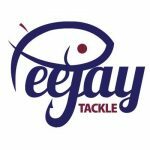 First to weigh on our lake was Steve Kedge who had 56lb 3oz from peg 2 so the golden peg was safe for another week, Jess had 39lb odd from peg 4, Gareth had 32lb from 6 and Craig had 50lb 8oz from peg 8. 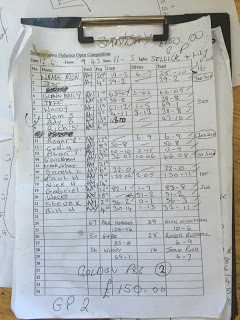 Dom had 38lb 8oz from peg 9 before Woody went into second place with 69lb 1oz from peg 11 but was pushed down into third when Gabe Skarba next door weighed 83lb 8oz. 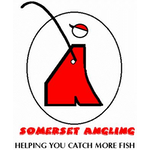 Adie Bishop had 43lb 10oz on peg 13, Nick Harvey didn’t weigh on 14 and Jeff had 38lb 8oz on 15. Then we got to Roger and his bootlace eels were nearer a pound apiece and along with two nice tench and that crucian he weighed 6lb 9oz and I didn’t think I had that. Jacko had 51lb 2oz and then it was my turn, my carp weighed 19lb 3oz before I pulled out my silvers net and it was closer than I thought but I fell just short with 6lb 7oz, Mark ‘Levi Roots’ Leahy didn’t weigh and Alan Jenkins had 13lb 9oz from peg 23. 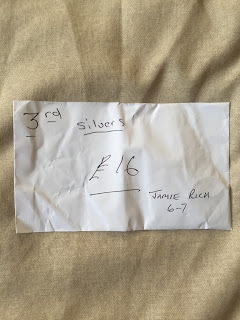 So I ended up third in the silvers and picked up £16.